Yes, that is a toilet by my front door. All those hundreds of commuters driving by our house each day will surely be waiting for us to fill it with a pot of red geraniums. But you know what? 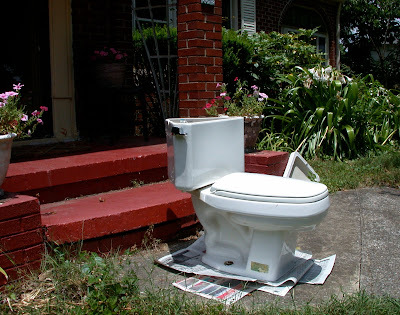 I'm really happy that toilet is out there, because that means Dr. H. and his wonderful brother are making progress. Greg drove up this week just to help us take out our rotten bathroom floor (literally rotten) and put in a new one. I don't mind that I have to use the nasty upstairs toilet or brush my teeth in the kitchen sink or that there is a toilet in my front yard. In just a few days, I'll have a new bathroom floor, one that doesn't have black mold creeping across it. And that's a really, really good thing. I feel the need to come clean. Everyone is always commenting on my beautiful yard. You know, the one I show in photos on my blog, like here and here and here. Wouldn't you just love to come sit on this bench and sip some pink lemonade with me? Or some good southern sweet tea? So here's the thing: first of all, the only pink lemonade we have around here is the kind that comes from a little packet labeled "Kool-Aid." And I don't really know how to make sweet tea. I was raised in New York, remember? 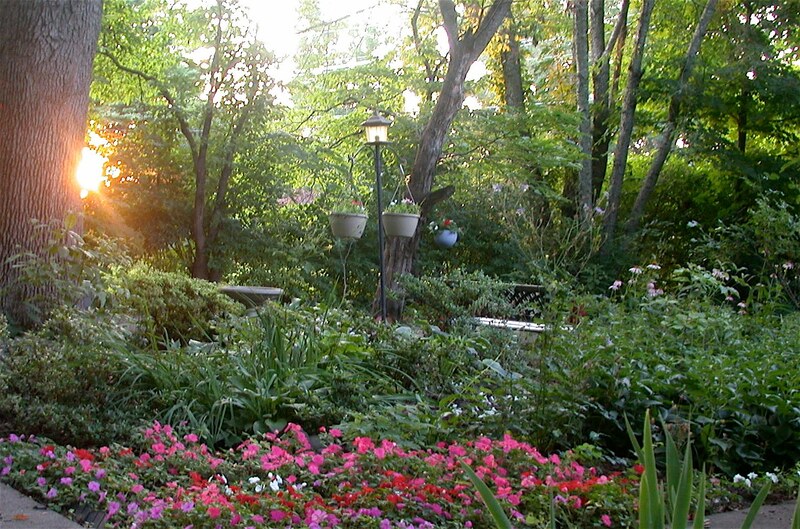 And this pretty bench area is right out in the middle of an incredibly hot patch of the yard. I just cropped the rest of it out. If you look closely, you can see poison ivy peeping out from under the mulch and mosquitoes hanging in dense clouds. For the past few weeks, the kids have had all kinds of activities to do: camp, VBS, a friend here each day. But starting next week, our days are blissfully blank for the most part. Since my youngest kids are 9 and 12, I have a tendency to let them do their own thing. The problem is that long, leisurely, empty days of summer with limited tech time lead to, "I don't know what to do." I find that it's good to be intentional about activities, even at this age. 1. Swim. We've been getting a pass to our local public pools for the past several years, and it is soooo worth it. I know some people are grossed out by the thought of public pools, but, well, I'm not. We have great pools, even if occasionally they have to close one because some kid pooped in it. Whatever. 2. Hike. We have a goal of heading to the mountains to hike and play in the river a couple of times each month. I'd like to say "weekly," but somehow that just doesn't always happen. 3. Arts & Crafts projects. I used to be so good about having all kinds of supplies and coming up with cool projects. I've slipped. My goal this summer is to have them each make a couple of Christmas presents for family. 5. Army guy/dinosaur rescue. Fill a plastic cup (preferably clear) with water, and drop in an army guy or other small plastic toy. Freeze until solid. Send the kids outside with a chisel or paint scraper (or other such tool) and let them chisel out the army guy. Duncan does this with a hammer and it only takes him a few minutes now, but when he was younger this would occupy a good 15 minutes. 6. Marshghettis: Give them a bunch of uncooked spaghetti (regular works better than thin) and mini-marshmallows and challenge them to build a bridge, an animal, a building, etc. They’ll get carried away with this one. You’ll even be able to write a blog, read a book, or—if you must—prepare dinner while they create. Also serves as snack time. 7. Games. Board games, card games, whatever. Inserting a game into the middle of the day breaks up the monotony. It doesn’t have to be a 2-hour game of Monopoly; even a 10-minute game of Crazy 8s somehow lightens up the Blahs. See my post on games for a few of our favorites. 8. Field Trips. It's hard to think of good places to go in the summer. My kids are a little too old for children's science centers, the zoo is too hot, museums seem too school-ish to them. I'm open to brilliant ideas for field trips! 9. Cleaning and organizing. I know that's weird, but my kids actually like to do this to a certain degree. This summer I've also engaged my 12-year-old in painting; in fact, she is painting our guest bathroom right now! I also have a plan to encourage them to find stuff to sell at an upcoming yard sale. Even Duncan enjoys doing this and thinking about the money he'll get. 10. Sewing: This one is for my 12-year-old. I have all kinds of project possibilities for her. She has a quilt to finish and then various fun things we've seen online to make. 11. Jewelry-making: Again, this is for my 12-year old. We haven't gotten into making earrings yet, but it's on our list of things-to-do. Got any more ideas? Please share! 1. Exercising with friends. The past few weeks, I've been walking/running (couch to 5K program) with a group of friends 2-3 mornings each week. I've always been a solo exerciser, but doing this with other moms adds a whole new dimension! I love it so much that I even agreed when the group decided to move our meeting time from 9:30 a.m. to 8 a.m. to avoid the heat. Getting out and about at 8 a.m. is stretching things for me, but I'm thoroughly enjoying it. 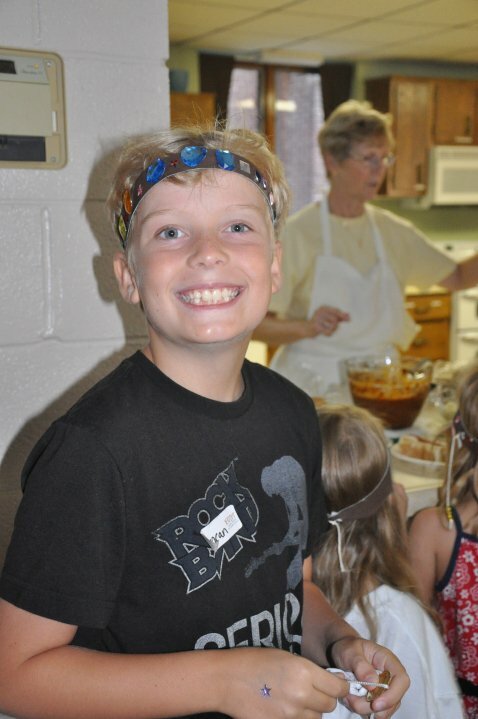 Duncan at VBS. Thanks, Donna! 2. VBS. I love VBS week at church. I love it even more this year because I got the first three nights off! The first two nights, Dr. H. and I went to my parents' house to play cards—uninterrupted. One night Randy and I went out to dinner and then for ice-cream all by ourselves. Bliss. I am helping out the last couple of evenings at VBS, but that's pretty fun, too. 3. Air conditioning. And water. We've been in the mid-90s for about 2 weeks now. We are so blessed to be able to have a comfortable house and plenty of water to drink. Most of the world struggles to stay cool and hydrated; we live in unfathomable luxury. "Bee Balm leaves and flowers and stems are used in alternative medicine as an antiseptic, carminative, diaphoretic, diuretic and stimulant. An infusion is medicinal used internally in the treatment of colds, catarrh, headaches, and gastric disorders, to reduce low fevers and soothe sore throat, to relieve flatulence, nausea, menstrual pain, and insomnia. Steam inhalation of the plant can be used for sore throats, and bronchial catarrh (inflammation of the mucus membrane, causing an increased flow of mucus). Externally, it is a medicinal application for skin eruptions and infections." Wow! I was just so excited that, after being planted three years ago, it finally flowered this year! The weird thing is that it was red when I planted it the first year. My botanists have nothing to say about that. Linked to Wordless Wednesday, Seven Clown Circus, and Five Minutes for Mom. Lately I've been getting up ridiculously early for me. I'm really a 7:15 a.m. person; but for the past week, I've been waking up at 6:20 on the dot. No alarm clock, of course. No early morning children, barking dog, or meowing cats. I just wake up. It wasn't too long ago that I thought waking up at 7:15 was ridiculous, and yet I couldn't seem to sleep in any longer. It's hard to believe that I used to (many, many years ago) sleep in until 10 or 9 or even 8 a.m. I can even remember summer mornings as a teenager, waking up to the sound of motorboats and waves lapping the shore and the smell of lunch cooking at 11:30 a.m. But I don't miss those days because mornings are so perfect. I love to have an hour or two all to myself. I love to smell the morning and to watch the sunrise over the flowerbeds and the mountains come into focus. I meet a group of friends at 8 a.m. two-three mornings each week for a run, and we're all back to our homes by 9:00. Other mornings I accomplish all kinds of virtual paperwork and even have leisurely time to read blogs and even comment. Who would have imagined, all those years ago, that the mornings hold such joy? We have a screensaver on our kitchen computer that is a continuous slideshow of our life. Photos of the kids, friends, and family flash across the screen. Duncan is particularly fascinated with the old photos. He'll sit in the computer chair and comment on every one that passes by: "Aww, that's baby me." "Aww, look at that giant snowman that we made." This one popped up today as I was getting breakfast ready for him, and we cracked up at his haircut. I can distinctly remember butchering his hair like that, and having to admit to someone at church, when she asked, "Did big sister give you a hair cut?" that um, no, it was his Mama. Hair cutting has never been one of my talents. I love Laurel's hair in braids like that. She didn't let me "do" her hair very often. And that little nightie that she's wearing! When she started wearing that it came to her ankles, and I believe she wore that until it came up to mid-thigh years later. But what I really love is the looks on both their faces. 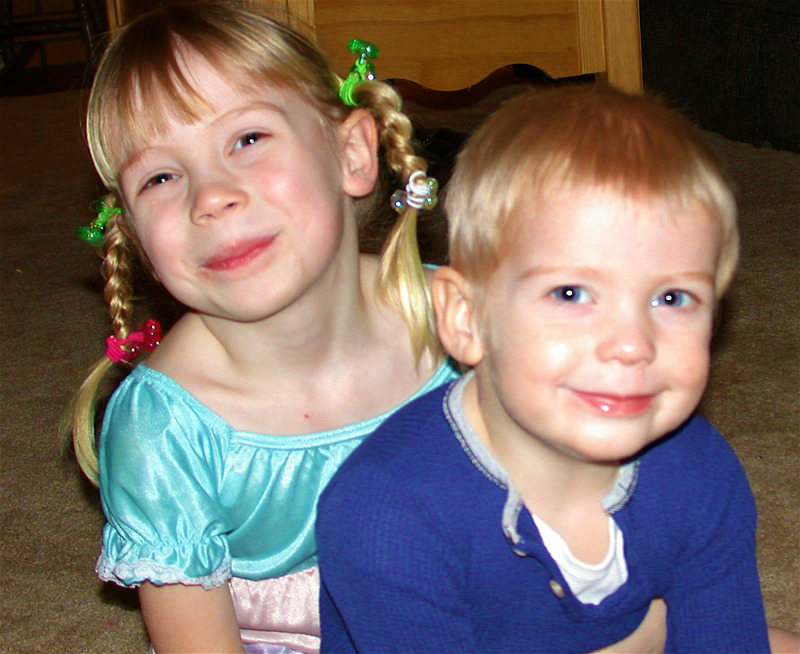 She loved being a big sister to a baby brother, and he adored her. Now at nearly 13 and 9.5, they get along really very well for the most part. Every now and then Laurel will even play Legos with Duncan. But mostly they do their own thing, Laurel entering into the world of teen interests and Duncan still thoroughly immersed in boyhood. Take a journey through some of your pictures and see what memories you'll find there. If you write a Monday Memory post, please leave me a comment so I can visit! You can't really start here. You have to start here, with Our Love Story. The engagement itself wasn't what he had planned. He planned to hike the Appalachian Trail, and at the very end—Mt. Katahdin in Maine—he was going to have me meet him there, and he would propose at the summit. Except we didn't really want to wait that long. It takes 5 months to hike the AT at least, and you can't start until about April, and well, we didn't really want to wait that long. We had already decided to get married. We had already decided that that evening, he would ask my Dad. For him the story is much more dramatic because all I had to do is sit at home with my Mom, reading a book or something. He was out "playing tennis" with my Dad, nervously awaiting the moment when he'd ask this man if he could marry his only daughter, his baby girl, the one with 4 older brothers. He asked. My Dad said yes. They came home from playing tennis. And then I was surprised. Because we'd already agreed that we wouldn't have an engagement ring. We already each had an engagement earring (yes, we did; he still wears his), so who needs a ring? Plus, we were flat broke and thought furniture would be better to have than a ring. But he had bought me one anyway, the sneak. And he gave it to me right there at the dining room table in my parents' house, and I said yes, too, of course. And that engagement day was nearly 22 years ago, in a house that is no longer in our family, on a cool September evening in upstate New York. And our oldest son is nearly the age that we were when we met, and people swear he looks just like his Dad. I'm just glad he acts like him, because that's a good kind of person to be. Him: I did tell you! You were standing right there when we were talking about it! Me: Um, but I wasn't really listening to you. Me: Wait, you did what? Him: But you knew we were! I told you in the kitchen, remember? You were right there! Me: Um, just because I was standing there and looking at you, that doesn't mean I was really absorbing what you were saying. Yes. That is a problem. He thinks I am listening to every conversation that he and his friends have; the reality is that I have the ability to completely tune them out. N: I'm bored. Bored bored bored bored bored. D: Me too. We're bored, we're bored. D: I farted with my eye. N: I farted with my eyebrow. D: I farted with my ear. N: I farted with my bottom, which is where you really fart. D: I farted from my belly button. N: I'm the super fart! I'm the super hero of farts! D: My fingers are a super Ninja. N: Hey! I invented that! I invented the finger thing! Is it really any wonder that I am trained to tune out conversations between boys? I mean, really, "I am super fart?" and "I can fart out my eyeballs?" Please don't judge me for not listening. You drove me to it. 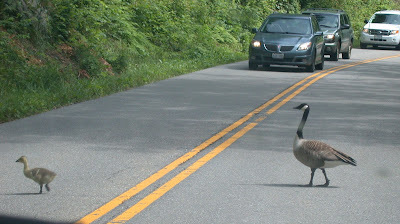 I am not one of those people who stops to take pictures of wildlife in the Smokies, but this just cracked me up. 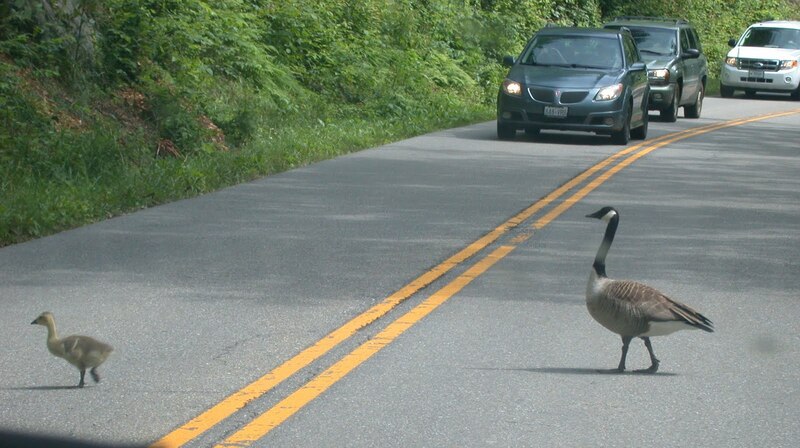 We were headed up to take a short hike and play in the river with friends last week, and about halfway up we had to stop and let a family of geese cross. (That is a goose, right, not a duck?) A Friday in the Great Smoky Mountain National Park, where 8 million tourists visit each year, and all traffic stops for this family of 5. (Dad and the others were already safely on the side of the road.) I love the power these little creatures have over us in our vehicles, love that moment that reminds us that we are in their home. This week a college friend posted a link to a Food Network recipe that looked delicious (thanks, Angie! ), and I ended up getting all my menu items from there. Between Food Network, Pioneer Woman and her Tasty Kitchen, Rachael Ray, and then weekly idea blogs like Menu Plan Monday and Tasty Tuesday, I should never have an excuse for wondering what's for supper. But I still do. Some days we end up ordering pizza or eating fish sticks. Lame. Tonight we're having salmon, for my nearly vegetarian (fish only) son who is returning from a 4-day music festival at which he's been eating little but granola bars and peanut butter. Next week the kids have Vacation Bible School all week—which includes supper each night— so I may not cook at all. Or we may eat things they hate all week, like smoked salmon, tofu, and big salads. We know how to live around here! Linked up with Tasty Tuesdays and Menu Plan Monday. We're done. I've graduated the first one. It's time for a long summer break. Here are all the things I'm going to do this summer. Or at least 10 of them. Mostly, I just want to hang out with family and friends and sit by the pool and the river a lot. Like today. I need a break. They need a break. I like long, lazy summers. We don't do any book work over the summer, but that doesn't mean they aren't learning. I don't really get the whole "they'll forget everything they learned over summer break" argument. I've never found that to be true with my kids. They always seem sharper in mid-August when we resume. I think it's all the good, fresh air. 1. Paint the guest bathroom. 2. Move Duncan's room upstairs. 3. Turn Duncan's current room into an office. 4. Go sailing with my brother. 5. Go camping at least twice. 7. Clean the sun porch. 8. Buy a cover for the light switch in the dining room. 9. Put pictures up on the walls of the dining room. 11. Go to the pool regularly. 14. Keep all the plants living. 15. Prune the jungle at the side of the house. 16. Prune the jungle in the back of the house. 17. Prune the jungle at the front of the house. 18. Sit around and chat with friends. 19. Have people over for dinner. 22. Plan AHG for next year. 23. Make a photo album of Jesse's senior year. 24. Have girls over to do AHG badges. 25. Sit on the bench in the evenings with Dr. H.
26. Do co-op lesson plans for next semester. 27. Do lesson plans for my kids for next year. 28. Finish grading essays from this past semester. 29. Visit my parents every day. 30. Enjoy my oldest before he goes off to college. What's on your agenda for the summer? Linked to Writer's Workshop at Mama's Losin' It. I'm so excited to get back to my yard. All our Big Events are over now, and the flower beds are beckoning. I've got loads of pruning to do. I intended to get out first thing this morning, but a huge storm rolled in. I folded laundry instead, which is not nearly as gratifying as taking down a big branch. Right now just a few black-eyed Susans and purple coneflowers are blooming; within a week, my main flower bed will be a mass of yellow and purple. 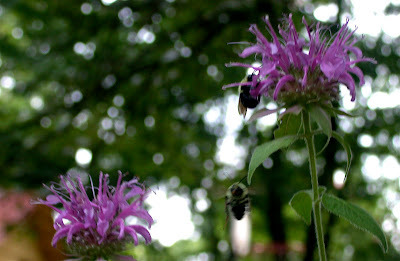 The bee balm and a couple more varieties of lilies are due to burst in the next couple of days. I've put my nine-year-old to work this year watering my flowerpots, and they are flourishing thus far. It's well worth the few dollars each week to have someone else be responsible for them! What's happening in your yard this week? 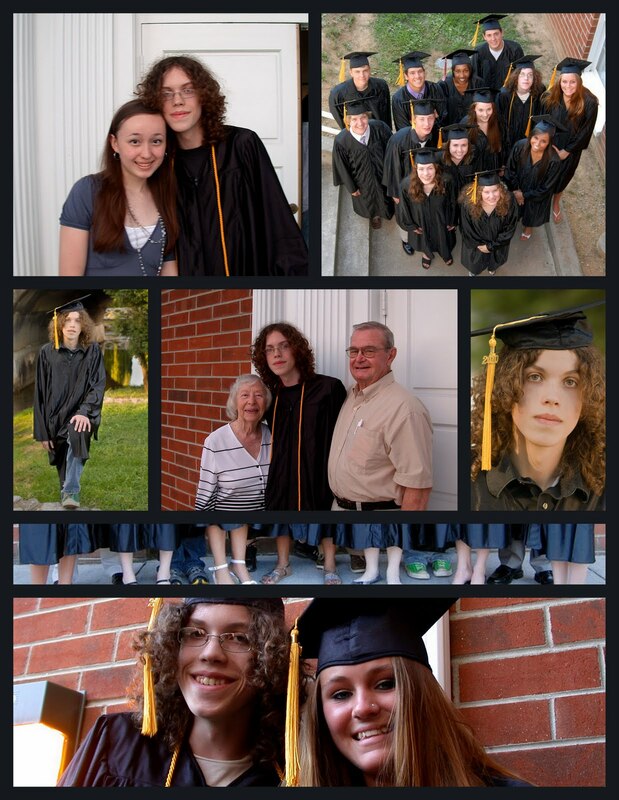 We have pictures of him with his friends, with his grandparents, with his fellow graduates. We even have pictures of his feet and of his tassel. How can it be that we have absolutely NO pictures of him with us or with his brother and sister or with his other grandmother, who drove 250 miles to get here? Sigh. Regardless, we did it! My homeschool graduate is ready for college to begin. Linked up at Wordless Wednesday and 5 Minutes for Mom. 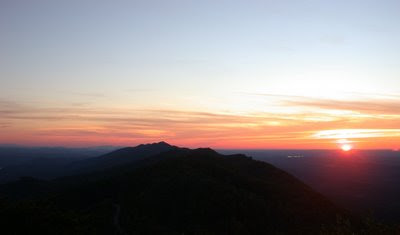 Knoxville lies in the shadow of the Great Smoky Mountains and the Cumberland Mountains. It is the hub for three major interstates: I-40 from North Carolina to California, I-75 from the Great Lakes to the Gulf of Mexico, and I-81 from Canada to Knoxville. More than 60 million Americans are within a day's drive of Knoxville. Historical: Try James White's Fort, Marble Springs Historic Farmstead, Blount Mansion, Ramsey House Plantation, East Tennessee Historical Center. Or take a 30 minute drive to visit Fort Loudoun and the Sequoyah Birthplace Museum. Most people, however, don't come to our area to visit the city of Knoxville. Most come for what we like to call Our Big Backyard: the Great Smoky Mountains National Park (GSMNP). The Park, which was dedicated by President Franklin D. Roosevelt in 1940, consists of 510,030 acres of beautiful ridges, hollows, river gorges and coves. 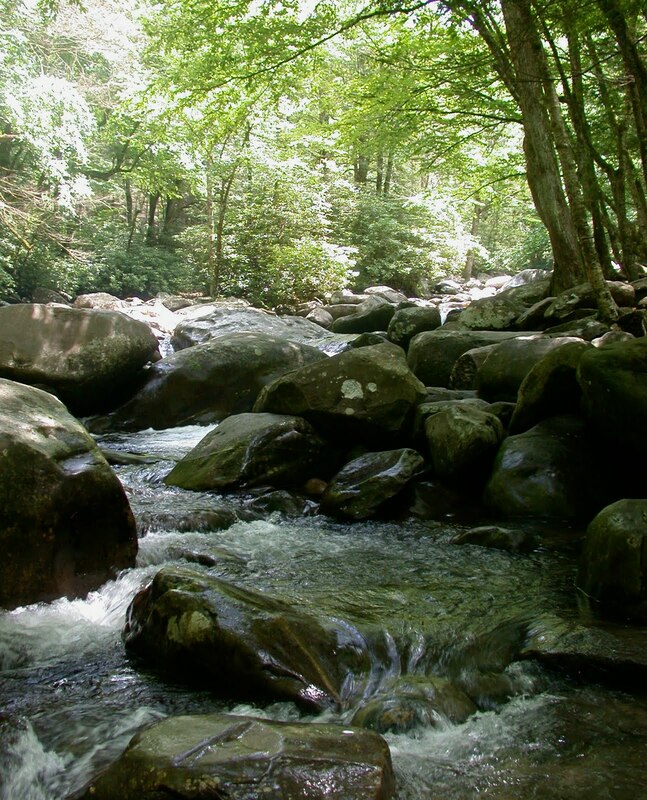 With over 8 million tourists each year, the GSMNP is the most visited national park. Those are just a few of my hundreds of photos that we've taken on our many hikes and camping trips. If you want to see some truly spectacular photos of the Smokies, please visit my friend Lynn Freeny's website. My photos might make you think, "Hey, I might like to go there." His will make you pack your bags and head out the door. Cades Cove is the most visited spot in the Smokies; click on that link to take a tour with us from a couple of years ago. And before you come, check out my post In the Smokies: Selected Reading. 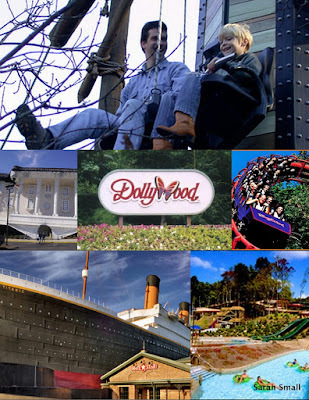 You can read more things to do in Gatlinburg, Sevierville, and Pigeon Forge, including all the information about places to stay and the fantastic outlet shopping. 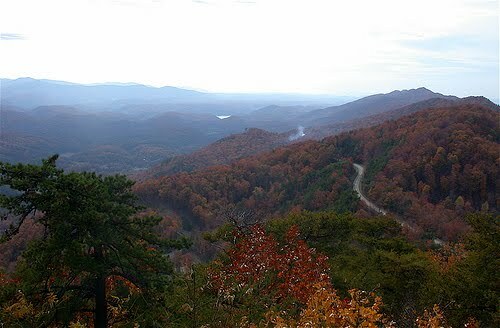 But if I were coming to visit the Smokies, I'd stay in Townsend. 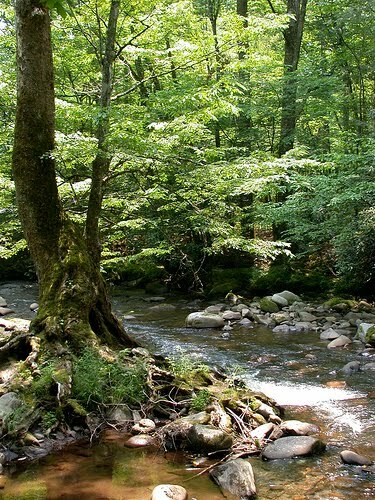 Around here we call it "The Peaceful Side of the Smokies." 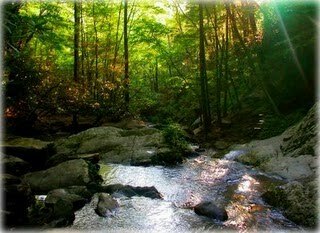 You can get to Gatlinburg in 30 minutes or less from there if you really want to, but there are plenty of things to do right in Townsend (if hiking in one of the most beautiful places in the U.S. isn't enough for you). We love Tuckaleechee Caverns and the Great Smoky Mountain Heritage Center. And if you're coming in the summer, tubing on the river is a must. There is no doubt that the Knoxville area has something for everyone, from shopping to amusement parks to museums to hiking and camping. You could spend thousands of dollars on a vacation filled with rollercoasters and hot tubs, or just a couple of hundred of you like to camp and hike. 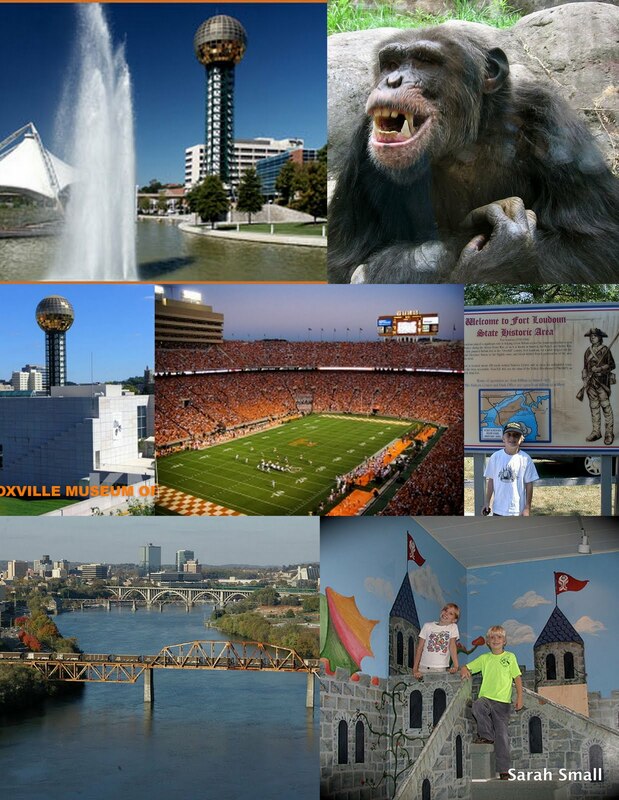 Knoxville is the featured destination today on the virtual tour at Blog Trotting. 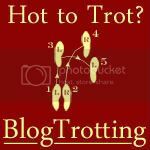 You can get an insider's view of all kinds of cities across North America every week at Blog Trotting—it's a great way to plan a vacation! You can't actually see him in the picture, although you can see his green Converse. But he's there, tossing his cap up in the air. Three years, 25 credits, 14 hours of college credit already tucked under his belt. High school graduation is a big milestone for any parent. The pride, the joy, the tears shed for that little guy who once carried his crayons and glue sticks in a Matchbox-car backpack, now proudly accepting his high school diploma and moving his tassel from one side to the other. Sweet success—he did it! My Dad came across this photo of himself and his Dad, my granddad, taken in about 1943. 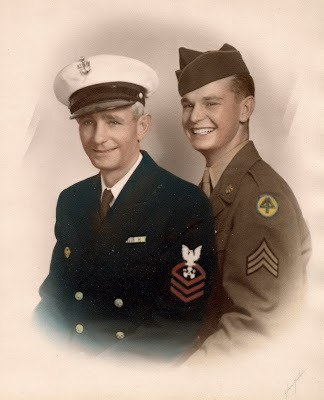 My Dad is about 18 and Granddad is an old man of 42. I can't believe I've never seen this photo before, and now I'm madly in love with it. I'll be searching for the perfect frame. Linked up at Wordless Wednesday and Five Minutes for Mom. I've been occasionally aware, these past few weeks, of that peculiar feeling of the days slipping by without my really being fully part of them. It comes partly from being pulled in so many different directions—of being truly concerned about and involved in so many emotionally heavy and time-consuming areas: church, my parents, friends, our support group, our AHG troop, the classes I teach. And, of course, my family. Everything these past several months has been focused on our oldest: college, job, Eagle Scout, graduation. Tomorrow Randy's family comes in for Jesse's graduation, and the graduation blitz begins: rehearsal, pictures, graduation itself, then the graduation party. Cleaning, ironing, cooking meals, baking, gathering items for his display table—these are all things I have to do. But beyond the doing, beyond the sitting in the living room chatting with people, beyond the practicalities of finding the tassel and figuring out how to pin on the cap, beyond all that doing is the elephant in the room: my child is graduating. It hits me at times like last night, when Randy, Duncan, Laurel and I played frisbee in the backyard. It hits me on evenings when Jesse is at work and just the four of us are eating dinner together, with Duncan moving into Jesse's spot at the table. After this summer, it will just be the four of us, all the time. Our family dynamic is changing, and even though it has been evolving over the past year, especially since Jesse has been working, the fact still hangs over me. Yes, I'm happy that he's graduating. Yes, I'm thrilled that he's going to college. 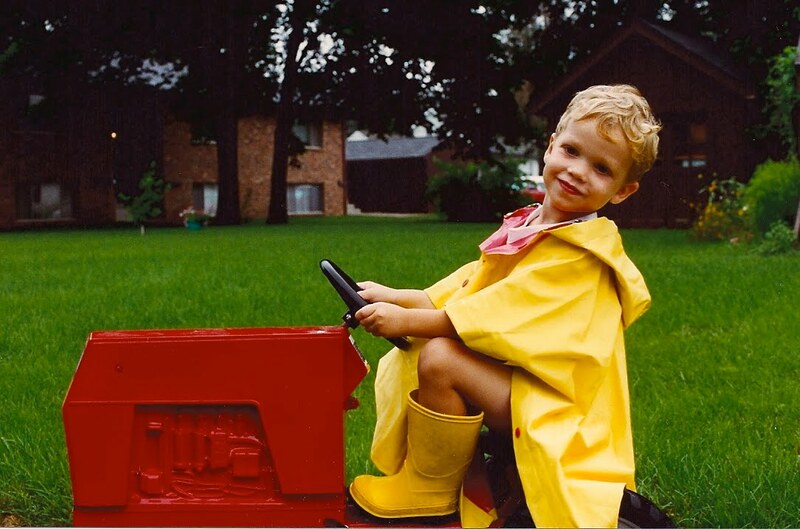 But once upon a time, he was a little blond boy in yellow rain boots on a bright red tractor. And that's why I have to keep busy.